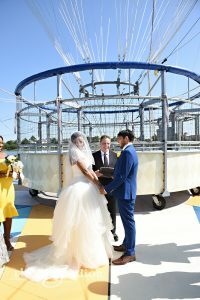 Deona and Daniel along with a small group of family and friends launched their marriage in fantastic style, by holding their ceremony on the Disney Aerophile Balloon in beautiful Disney Springs. Disney Springs is the development of Walt Disney World and features the gorgeous balloon ride featured in the photo below. They built custom, intimate ceremony which focused on four very important ingredients: Love Loyalty, Fidelity and Trust. They are a very spiritual couple who firmly believe in the words about love, which Lon Tosi from Sensational Ceremonies read for them. The reading ended with this statement: “It was love that brought you together to unite your destines. They so believed in this statement. The amazing photos shown were taken by Rhodes Studios. The gorgeous bouquet and boutonnière were delivered to the site by Flowers By Leslie. After the ceremony on the platform at the balloon base the couple and their audience launched 300 feet into the air to enjoy the great sites of Disney Springs, Orlando and beyond. Amazing! The couple planned to spend their honeymoon at Walt Disney World and touring other Orlando attractions. We wish you all the best with marriage!